Please fill out the form to the right to contact us. We look forward to hearing from you and we will do our best to respond as quickly as possible. We all love the ocean but did you know the negative impact plastic straws have on it? According to The Last Plastic Straw organization, Americans use and throw out 500 million plastic straws PER DAY. We connected with the team over at Simply Straws to learn more about this issue and how they are helping to address it. The solution...glass straws! We purchased one along with a case and are working on adjusting our habits and saying NO to plastic. It is an investment but well worth it considering the impact your behavior will have on the environment. It is easy to keep it in your bag or at your desk. And let's not forget the variety of colors you have to choose from. Thank you Simply Straws for taking the time to answer our questions. We know we can certainly do better! Q: Plastic Straws - we are not all aware of how awful they are for our beloved sea. Can you tell us more about this problem and help us understand why we should be changing our behavior? A: There is a big misconception that we can throw away plastic. Plastic straws, plastic bottles, plastic bags, snack wrappers, foam takeout containers, foam coffee cups, and packing materials: these common, everyday items make up 85% of our waste stream. These items aren’t biodegradable and our ability to recycle them is limited. A single discarded piece of plastic breaks down into millions — and these bits are mistaken for food and ingested by even the smallest organisms on the oceanic food chain. Contaminated zooplankton feed on phytoplankton, which are fed on by small fish, who are fed on by squid — and so it goes on up to our dinner plates. The longer-term solution is not just to recycle more: It is to use less! By reducing the amount of plastic we use, we make a more profound impact on the environment than by recycling. Q: Tell us about starting Simply Straws & what the reaction has been so far? A: Starting Simply Straws was a labor of love for our bodies and our planet. As a family we wanted to offer a solution to the plastic straw that would be healthy and long lasting. After much research we found the only real solution was glass, it is BPA free, non-toxic, easy to clean and has no favor. The moment we launched Simply Straws, we were happily surprised at the overwhelming response to our straws. We have been blessed to work with many Non-Profits helping to educate and activate others to refuse Plastic Straws. Q: A lot of us are on the go all of the time grabbing a juice or iced coffee, which comes with a plastic straw. How do you recommend we approach this lifestyle? A: Just say “NO straws please.” The more you do it the easier is gets. Plus, be sure to take along your Single Sleeve Set including a Sleeve to carry your straws, a Reusable Glass Straw & a Cleaning Brush. This helps you remember to say no and you will love having it available where ever you go. These durable straws can go into your backpack, purse, car pocket, wherever you go these can go with you. In Addition, to keep you using your straws we offer a lifetime guarantee, however I don’t think you will ever need it but it is there to give you peace of mind. Q: This might be a silly question but are there any issues with the glass straws clinking with our teeth? A: Our straws were conceived by a dental hygienist to help her offer her patients a alternate to the plastic straw. It is made from Borosilicate Glass, like pyrex and is very durable but still feels smooth and gentle in your mouth. Think of it like using a drinking glass, under usual circumstance do we click our teeth on it? Q: How long does a glass straw last and how best to clean them? 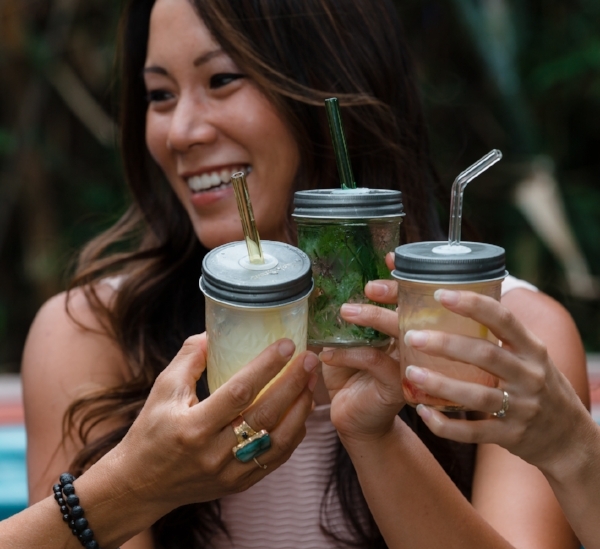 A: Our reusable glass straws are meant to last a lifetime. If so how they become broken we do offer a lifetime guarantee. Glass straws clean easily, we suggest if you are drinking something with milk or fruit pieces after you are done take a quick sip of water to clean out the straw. They are dishwasher safe and we do have cleaning brushes if you need that extra assurance. Q: Lastly, a lot of us have plastic straws sitting around our house, any recommendations on how best to dispose of them before we make the big switch? A: Over 80% of ocean plastic comes from land-based sources. Even if you live inland and take care to properly dispose of your trash, there is a good chance some of your plastic waste has found its way to the sea. I wish I had an absolute answer to this problem. It is best to place them in your plastic recycled bin and say no to plastic straws when you go out.